I received a complimentary copy of this book as a part of a book tour for a fair and honest review and rated it 4.5 out of 5 Stars. A fan of crime stories solved by partners, I was thrilled to be given the opportunity to read and review The Tempest by James Lilliefores. 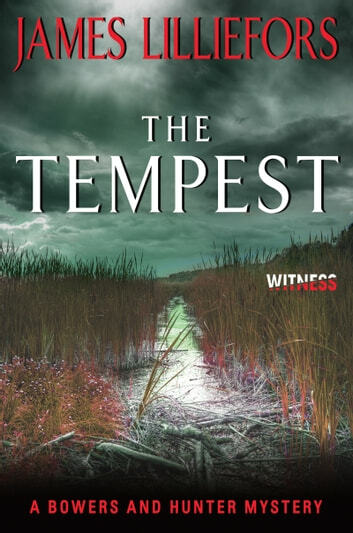 I had planned to read the first book in the series, The Psalmist, however I ran out of time and decided to just dive into The Tempest. Fortunately for me, this story stood well enough on its own and I was able to enjoy the story, and the characters, as the story developed. If you’re a fan of book series, movies or t.v. shows featuring crime solving duos, such as Rizzoli and Isles or Major Crimes, this is a book you’ll definitely want to check out. Mr. Lilliefores does a good job introducing us the to the central crime figure behind the mystery from the very first page and then slowly introduces us to the victim, and the crime solvers Methodist Pastor Luke Bowers, and Amy Hunter, Tidewater County's chief homicide investigator. While it’s not normal to pair a religious leader and a cop as crime solvers, I found this duo very interesting and enjoyed getting to know their characters both individually and as a duo. When a summer tourist visiting the area, and temporarily attending Luke’s church, approaches him about her fear her that her husband is going to harm her, the first person he naturally thinks of involving is Amy because of their past association solving a crime. When the woman turns up dead, Luke and Amy find themselves being drawn into another murder mystery, and one that involves organized crime and stolen art masterpieces. The secondary characters, from Susan Champlain, the murder victim, to the members of Luke’s church, the people in town and the criminals involved are all well developed and I enjoyed watching them interact with Luke and Amy as they investigate. While we do get to know what is going on in both character’s personal lives at the same time, the story’s main focus is on the crime solving and not on their personal drama and angst, something which often derails so many stories lately. . The mystery was well developed and well-paced. There were plenty of twists and turns to keep the reader interested and clues and revelations were shared at just the right time. The story was filled with plenty of suspense and with the characters determination to see justice prevail. I especially liked how both Luke and Amy’s sense of justice felt natural and how neither character used the events taking place as an opportunity to “preach” at the reader and instead let the reader reach their own conclusions on how justice would best be served. Will Luke and Amy discover who is behind the murder and why Susan was killed? Will they be able to bring the criminals to justice or will the stolen masterpieces remain hidden from the rightful owners? You’ll have to read The Tempest to find out. I really enjoyed reading this story and look forward to reading the next installment in this series. Suspenseful and intriguing. A classic whodunit with an unexpected ending. I cannot wait to read the first book in the series.